There are people that haven’t heard of Calvin & Hobbes. Or they’re vaguely aware that it’s a comic strip, but then remember that they think comic strips are for kids and, well, there’s so many more worthy things to sink their time into. I feel sorry for these people. Without doubt, Calvin & Hobbes by Bill Watterson is one of the cultural highlights of the 20th century. Bold words, I realise, but allow me to explain. Firstly, it’s not for kids. Well okay, it’s not just for kids. Sure, it’s a comic strip featuring a six-year-old kid and his stuffed tiger that comes to life when no-one else is around (Or does it? OR DOES IT? etc.). But to write it off as childish is to do it a grave disservice. The subjects they discuss are growing up, death and loss, art (usually while neatly skewering the pretentious art world that so looks down on Watterson’s craft), morality, consumerism and commercialisation, integrity, the purpose of life, philosophy, humanity, the nature of enjoyment… The list goes on. And these themes are interwoven so deftly that at times it takes a few readings to capture the nuances. Can a kid read this and enjoy it? Sure. For every strip where Calvin and Hobbes debate some aspect of humanity there’s one where Calvin’s “boogers” freeze, or Hobbes gets washed and is too dizzy to walk in a straight line. Kids love it. But read it as an adult and a whole new level opens up. Love, loss, joy, pain, excitement, fear and everything in between are dissected with Watterson’s trademark humour and style. Seeing the world through the eyes of a six-year-old and a tiger is incredibly revealing, and more than a little touching. Anyone that can read the ‘little raccoon’ series of strips and come away with dry eyes is a heartless monster. A MONSTER. It’s rare for a work of art spanning so many years (a decade) to be so clear, focussed and consistently excellent. Part of that success is Watterson’s obvious and deep love for his characters. No matter how much of an annoying brat Calvin is or how joyously silly Hobbes gets, they remain beautifully crafted, deep and rounded characters. You can’t help but love them. Even the supporting cast is superbly fleshed out, from mom and dad to arch-nemesis/love-interest Susie, Rosalyn the baby sitter and poor old Miss Wormwood the long-suffering teacher. Watterson’s perfection of his craft certainly adds huge value to Calvin & Hobbes as a work that will, I’m certain, stand the test of time. The dialogue is pitch-perfect, the artwork consistently top drawer. Even now, more than 20 years after the final strip was published, the themes and writing are relevant and thought-provoking, the artwork never less than the best I’ve ever seen in a comic strip. In fact, sometimes Watterson’s penmanship is so good that the artwork alone brings about a belly-laugh without having to read a word. The fact that in over 3,000 strips and 10 years the quality barely dips at all is staggering. I cannot think of another artist, in any field, with that kind of hit-rate. Maybe Prince. Maybe. That’s the level of quality on display. 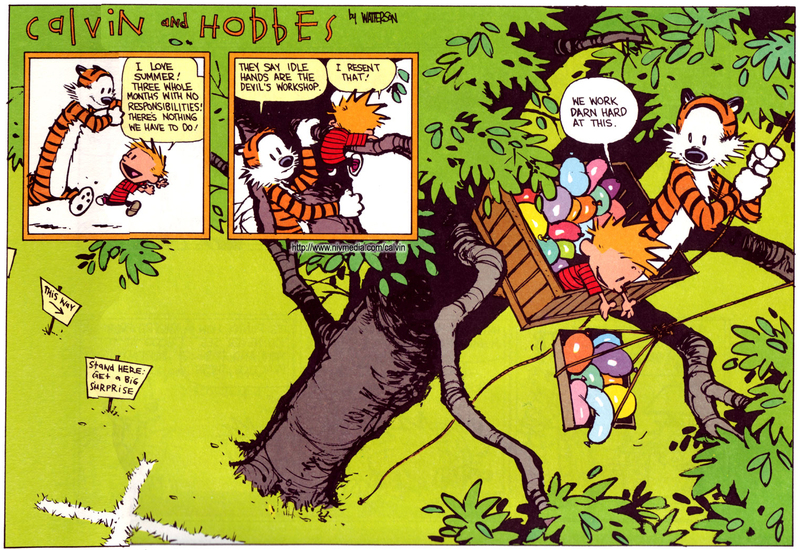 Finally, and probably the thing that impresses me the most, is Watterson’s integrity. These days he’s virtually a recluse, despite the clamouring from fans across the globe that would hang on his every word and buy anything he put his name to. Why has he retired from the public eye? Because he wants to live his life in peace and recognises how vapid and meaningless worldly “fame” truly is. What has emerged from him over the years is a distinct non-materialist focus. A focus instead on enjoyment, job satisfaction, craft and family. A message the strip clearly reinforces and, I feel, an important one in these oh-so-materialistic times. Even during the strip’s life this uncompromising vision came to the fore. 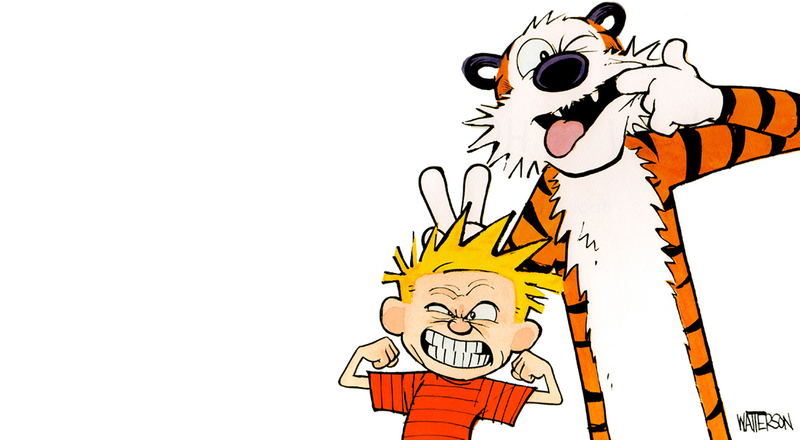 For instance, Watterson refused to sanction or allow the production of any Calvin & Hobbes merchandise. This may seem a relatively small thing, but consider the potential – Calvin & Hobbes has sold almost 50 million books and been syndicated in newspapers worldwide. The only other strips that come close to that or surpass it are Garfield and Peanuts. Conservative estimates are that Watterson turned his nose up at hundreds of millions of dollars in revenue on principle. I cannot think of anyone else in the history of art that has stuck so rigidly to their principles and eschewed the opportunity to get obscenely wealthy. Why did he refuse to merchandise? Because it wasn’t in the spirit of the strip. He intended it to be a comic strip and nothing more. For there suddenly to be a Calvin & Hobbes lunchbox or pyjama set would, in Watterson’s eyes, massively damage the work, undermine its message and miss its entire purpose. And to sell Hobbes soft-toys? Well, surely that would just answer the question of Hobbes’ true nature once and for all, thereby ruining one of the great mysteries of Calvin’s world. This integrity feeds into the very structure of the strip. Watterson famously fought tooth and nail against the shrinking space his strip was afforded in newspapers, demanding the space the artwork needed to breathe and flourish. The result is a half-page, full colour Sunday strip that is consistently head and shoulders above anything else produced at the time or since. Each strip is obviously crafted carefully, agonised over. I’m sure there were times when Watterson’s enthusiasm for the strip and the demands of its production waned (how could there not be over such an extended period). The fact that it doesn’t show is an object lesson in the benefits of determination to maintain quality over time. I’m not going to say any more about why I feel Calvin & Hobbes is such a superlative work. Firstly, those that know and love it (i.e. anyone that’s picked up a Calvin & Hobbes book), don’t need telling. 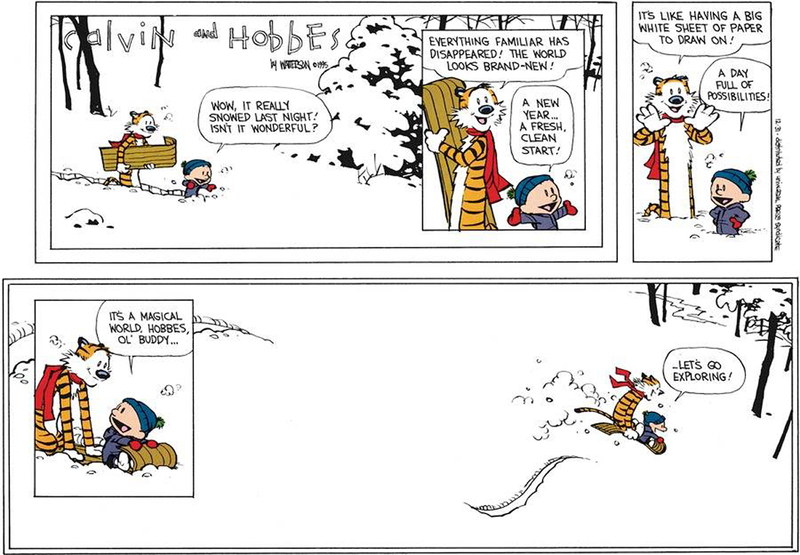 Secondly, because one of the great joys of this world (and it is an entire world that Watterson invented) is the pleasure of discovery, of exploration. There are places online you can read the strips, but I won’t link to them here. It’s too important a work, to great an achievement for anyone to deny Watterson his royalties. And his beautiful artwork is not done true justice when viewed on a screen. Go buy the books. Make sure you get the three-volume complete collection, it’ll cost you less than a good night out and you’ll have it to treasure forever. Read it beginning-to-end without skipping ahead. Come and join the rest of us in a world of spiffing spacemen, tremendous dinosaurs, time-travelling boxes, vaguely rubbish superheroes, G.R.O.S.S., Calvinball and murderous snowmen. You won’t regret it.